We've seen a lot of Christian Bale Batman impressions over the years and now we can add Spider-Man: Homecoming's Tom Holland to the list. Holland joined the ranks of Christian Bale impressions while out promoting Spider-Man: Homecoming, which is just about to hit theaters with a projected $100 million debut at the box office. Critical praise and word of mouth along with plenty of promotion are setting Homecoming up to be a big summer success, which is sure to set up the rest of the trilogy on a good note. Tom Holland stopped by MTV After Hours to promote the upcoming release of his first standalone Spider-Man movie where he revealed some of his lesser-known skills. Holland brought over an "exclusive" look at his "secret audition tapes" for Spider-Man: Homecoming, showcasing his many talents. The audition tapes come to us via MTV's official YouTube channel and they show the young actor partaking in some gymnastics while walking on his hands, a little bit of ballet, a talent for eating chips and talking at the same time, bad New York accents, and a proper Englishman, complete with a monocle and tea. 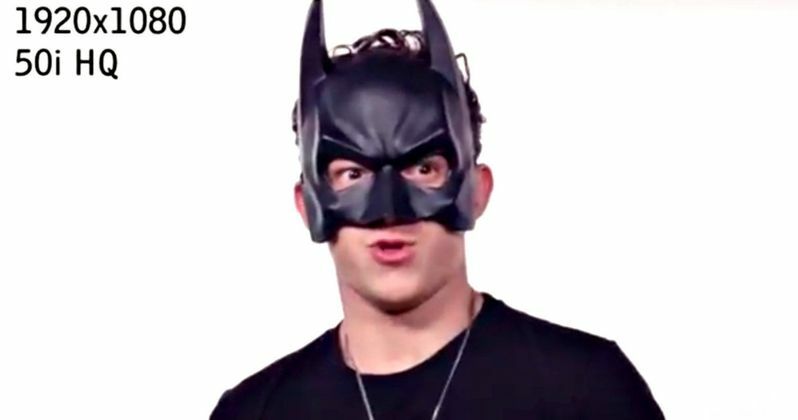 Holland saved the best part of his fake audition tapes by putting on a Batman mask and acting like Christian Bale. Throwing out quotes "with great power comes great responsibility" and "where is she?!" in a strained Bale tone while trying to keep a straight face. The interviewer argues that Batman and Spider-Man are not even in the same cinematic universe, but Holland keeps going, mentioning that there's been crossovers before. The satirical audition ends with Tom Holland continuing to throw out Batman lines before finally leaving the audition or being thrown out. Holland can add another talent to his already long list and that is clearly humor. The young actor had no problem making fun of himself and acting silly, which begs the question: is there anything he can't do? The positive reviews keep coming for Spider-Man: Homecoming from both fans and critics. Early screenings for fans and general moviegoers helped spread the word of mouth to fans who may have been skeptical of a new version of Spider-Man hitting theaters. While some fans remained skeptical, the critical reviews have started to come in and they're all generally positive, currently holding a 93% approval rating with 129 reviews, averaging a 7.6/10. While Sony is being a bit conservative with a box office estimate of around $80 million for the debut weekend, many sources are estimating that number to be much higher at around the $121 million mark. Spider-Man: Homecoming is almost officially here with some screenings even happening tonight. It's finally time to see how Tom Holland carries a standalone movie with a little help from Robert Downey Jr.'s Iron Man to battle Michael Keaton's Vulture. And if you can't wait for the movie, check out the fake audition for Homecoming below where Holland shows off a pretty wide range of talents from comedy bits to ballet and a little bit of everything in between.